The Walking Dead's Norman Reedus Is Super Adorable When Talking About Daryl and Carol—Watch! In the midst of all the blood, guts and horror on The Walking Dead, might there also be love in the air? Fans everywhere love the super close relationship between zombie-hunting hunk Daryl (Norman Reedus) and badass Carol (Melissa McBride)...even though there hasn't been any real hookup between them. Yet. Nope, just lots of shared intense looks, heartwarming hugs and some off-the-charts, crazy chemistry. And when E! 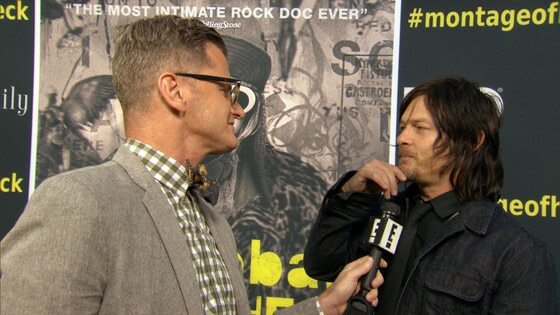 News' Marc Malkin caught up with Reedus at the premiere of the new HBO documentary Kurt Cobain: Montage of Heck to chat about the fan-favorite relationship, he got super adorable and protective about it. Seriously, we can't stop swooning...and laughing. That's just the Reedus charm at work! MORE: Who is returning to The Walking Dead for season 6? "The thing is, once you do that, it's done," Reedus says of any potential real hookup between Carol and Daryl on the show. "I like all the awkward things in between that make a person and make it honest. I think that that character, once he shacks up with somebody, he's going to be with them for life. I don't want to blow my wad, so to speak, right off the bat, you know what I mean?" But is Daryl "enjoying Carol's cookies" at the moment? "Let's not take it there!" he says with a laugh. Press play on the exclusive video above to see what else Reedus has to say about Carol and Daryl's fan-favorite dynamic, and what fans can expect from the sure-to-be epic upcoming season six of the AMC hit show! MORE: See the first teaser for The Walking Dead spinoff! The Walking Dead will be heading for a big reinvention when it returns this fall. Talking Dead host Chris Hardwick read a letter from showrunner Scott M. Gimple following the season five finale that promised new twists ahead. "Season six for a good while now, humans have been the bigger threat," Gimple's letter read. "At the start of our next season, that will change. I said the show reinvents itself every eight eps, and we're doing it again, friendos. Now that these characters know they have what it takes to survive, what are they going to do with that power? How will they choose to live? Beyond answering those questions, we're currently putting into motion some of our most ambitious stuff yet, and things are going to get very big, loud and scary." The Walking Dead returns this October, but its highly-anticipated spinoff, Fear The Walking Dead, premieres before that this summer. AMC released the first brief teaser during The Walking Dead's finale.